@K1l, you are entitled to your opinion. Coke master race. @K1l, but still can't compare to a cold bottle of IBC Rootbeer. @K1l, Why? You're absolutely correct. @K1l, i... 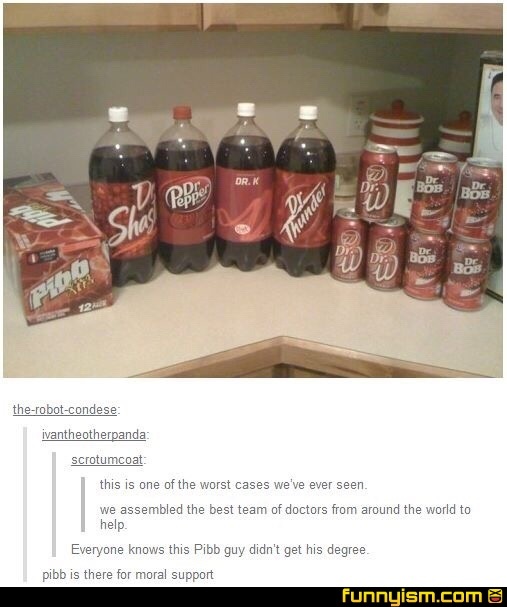 I never had Dr. Pepper. I've never seen it in a store. @K1l, as a Texan I am legally not allowed to. @A pet named Steve, oh you poor sheltered young woman. Come to the states. We have the goods. @A pet named Steve, you poor soul. @ThePandaPool , I was gonna say Barqs root beer, but to each their own. @ifyouaskme, thanks for the tip! @K1l, Dr. Pepper is the formalization of kid you running your cup through all the sodas at a fast food soda machine at once and mixing them into one drink. @K1l, I prefer coke, I don't drink anything that can't dissolve a nail in a day. If it doesn't liquefy my insides then is it even a drink? @The Gay Gatsby, realest talk. As a southerner its RC Cola and a moonpie. My dad was Dr. Bob. Now he’s not, but he was. @asmb100, Did he ever watch the Muppet Show? Pibb is an APRN, and he is just as valued as the rest of the medical team. Where's Dr Faygo? Where's Dr Zevia? Pibb is my favorite soda. Here’s why. I’ll admit the first sip of Dr. Pepper is amazing, but the following sips have no flavor at all, it’s just flavorless fizz. Pibb maintains its zest all the way down to the last drop. Pibb is also harder to find, so it’s more of a treat when you actually find a place that stocks it (although most Fred Myers and some Dollar Trees sell it). In my opinion, Pibb packs more of a punch.